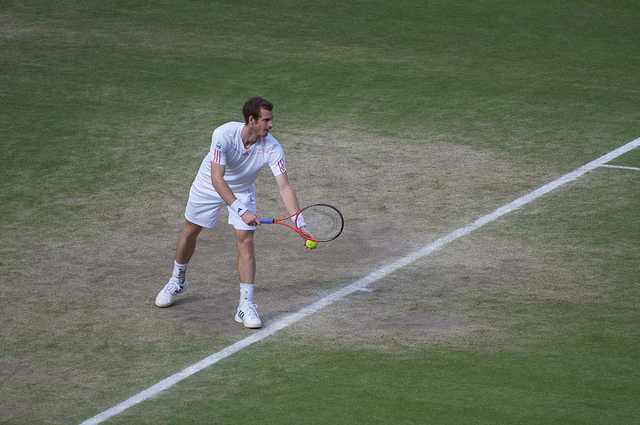 Have you ever felt like your tennis game has stagnated? You play matches and win the easy ones, but can’t seem to beat the same guy who you’ve lost to 6-4 6-4 for the 100th time in the past 3 years. And you haven’t improved that same old weak backhand and inconsistent serve even though you practice 5 times a week? Read on my friends. Here are six golden tips I’ve learned over the years that will help you improve your tennis game immediately. The number one reason why you aren’t improving is because you don’t have a plan when you practice. Think about it: if I have weak volleys, and I practice as normal by hitting a zillion groundstrokes and then calling it a day, will my volleys improve? You must (1) Identify the weakness; (2) Make a Plan to fix the weakness, and (3) Implement the Plan. [Remember IPI if you like acronyms…..or the letters P and I 🙂 ]. Sample practice plans include: (1) Today I’m going to work on hitting my volleys past the service line. (2) For the next 2 service games, I will hit topspin serves to increase my first serve percentage. (3) I’m going to spend 5 extra minutes per practice session hitting crosscourt backhands. Besides getting a good rhythm on your shots, you don’t gain much from stepping on the court without a plan of action. And this is especially critical if you have a technical flaw in one or more of your shots, because if you don’t fix the flaw then you are reinforcing inefficient mechanics into your muscle memory. Always have a plan when you are on the practice court! What do you want to improve today? Usually when people miss a shot, they believe a deficiency in their stroke technique is to blame. However, the number one cause of missed shots is when a player is out of position. I could have the crappiest mechanics in the world, but if I’m in perfect position for every shot, I will make more balls than the guy who is lunging to get a racquet on the ball. When out of position, a player will be off balance, unable to hit the shot in the strike zone, cannot take a full swing, and loses control of the shot. I’ve already mentioned how critical footwork is to your success in my How to Beat a Pusher: 5 Surefire Tactics article. If you haven’t already started working on your fitness, you need to do so immediately if you want to improve your game. In the morning or after a tennis session, do some footwork drills. And when you are playing a match, focus on getting to the ball as quickly and efficiently as possible. One of my coaches used to begin our sessions by making me catch tennis balls with my hand instead of using my racquet. That drill forced me to get into perfect position for hitting a shot. Remembering this concept really helps me get in position to hit a quality shot. The next time you play against a really tough player in a tournament or USTA league match, ask to hit with him or her sometime. Adding higher level training partners can really improve your game. I have found that my intensity, focus, footwork, and decision-making abilities automatically elevate to a high level in order to match my training partner if he is an exceptional player. If you get used to hitting with tough players, facing that caliber of player in a tournament will not phase you as much as going from practicing with Joe Schmo to playing a highly ranked player in your section. For example, this past summer I played two relatively weak players in the first two rounds of a sectional tournament. I probably could have won at least one of those matches eating a cheeseburger in my left hand. Then in the quarterfinals I played a much tougher opponent with a big game. It took me a set before I got used to his pace and spin, and by that time it was too late. If you want to improve your tennis game, practice with stronger players! An older gentleman who was watching matches at a tournament I played in recently commented that people who play tennis casually never reach their potential because they never challenge themselves. To truly highlight what you need to work on, there is no better way than to play in a tournament. Tournaments mean competition, where the goal is to win. The desire to win in a competitive environment tests how you perform under pressure. As a result, if your technique, footwork, or mental attitude is not solid, it will break down under pressure. Sure, you can hit a running down the line passing shot in drills and practice matches, but can you hit that shot at 5-all, 30-40? Another important tip here is to enter tournaments that have tough players in the draw. If you play the local club tournament or small tournaments and win against easy competition, it might feel good, but your opponents will not have the ability to expose the flaws in your game that you need to improve. For example, you might be able to protect your weak backhand by running around it most of the time against weaker players. But when you play someone with pinpoint precision and powerful strokes, you are now playing an opponent who can pound on your backhand every other shot. Now your weak backhand is exposed and will break down. You lose the match and realize how much you need to improve your backhand. Then (hopefully!) you will refer to Tip #1 above (Identify, Plan, Improve! ), and your backhand is now stronger because your weakness was exposed by playing a high-level player in a tournament. If for whatever reason you cannot devote the time to play tournaments, you can either play another form of competitive tennis (USTA Leagues) or serious practice matches. The level of pressure faced when you play competitively is as follows, from highest to lowest: Tournaments > USTA Leagues > Practice Match. So what are you waiting for? Get out there and play a tournament! Playing a tennis match against an opponent is like any other competition. You must assess the strengths and weaknesses of your opponent, and then formulate a strategy for defeating your adversary based on those strengths and weaknesses. Frequently I see players who lose a very winnable match because they did not implement the right game plan against their foe. Does he have a weak backhand? Does she struggle against topspin? Here’s another acronym for you: ABT = Always Be Thinking. Start by varying your shots in the warm-up. Hit slice, topspin, high balls, low balls, hard shots, slow shots, and any other variations you can come up with. Then see how your opponent reacts to them. And if the warm-up isn’t enough time, continue mixing things up in the beginning of the match to find out optimal ways of winning points. Keep a mental note of your opponent’s tendencies and patterns. Use this information to your advantage. It truly pays to pay attention when you are playing a tennis match. Being aware of your opponent’s game will be the difference between picking apart your opponent and laying down on the couch when you should have been out there playing in the next round. Feel like you don’t get to the ball that fast? Well, it may just be the burger and fries you ate before the match, or your daily lunch of pizza and a bag of Doritos. A select few of us are miraculously unaffected by this diet. However, the majority of people benefit from eating clean food, which results in higher energy levels and a more athletic physique. I recently cut out sugary desserts and drinks from my diet, and increased my veggie and lean protein intake. As a result, my speed on the court has improved and I feel less bloated. I was tired of feeling like crap on the court, and I wanted to do something about it. Fitness is paramount on the court, and if you feed your body unhealthy food, you will never be able to function at your maximum potential. I hope you found the above tips helpful. I am convinced that if you implement them, you will improve your tennis game immediately. Have any other ideas for improving your tennis game now? Comment below!